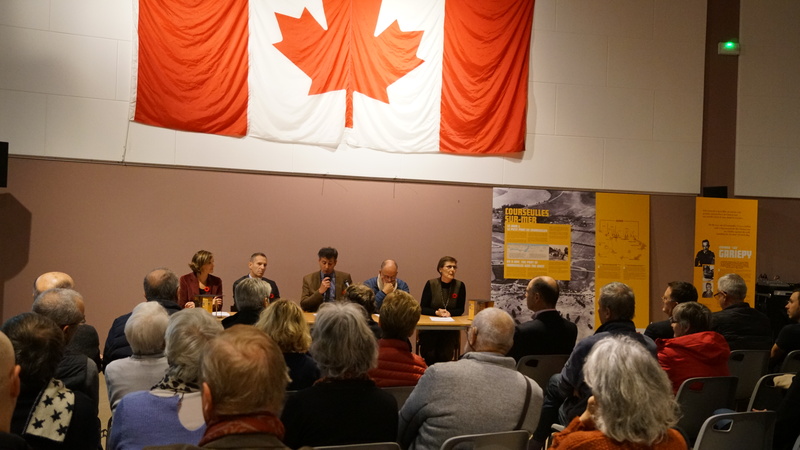 At a press briefing on Friday, November 23, the Tourist Office Terres de Nacre and the Juno Beach Centre were pleased to present the project for the new outdoor exhibition entitled “They Walk With You”. A smaller version of the future outdoor exhibition display was presented to the elected officials and representatives of the communes participating in the project (Courseulles-sur-Mer, Bernières-sur-Mer, Saint-Aubin-sur-Mer, Langrune-sur-Mer, Luc-sur-Mer, Douvres-la- Délivrande, Reviers / Bény-sur-Mer). The exhibition will be open to the public from April 2019 onwards. The scenographer Michel Cousin, « La Belle Ouvrage » for graphics and « Twelves Solutions » for the digital app were also attending to introduce the 2-year work report. The aim of the project, which started in 2016, was to gather all the people who work in tourism on Juno Beach around a common project to pay tribute to the soldiers and witnesses of the D-Day of June 1944. Elected officials, mecenas and families of witnesses will meet again for a new press briefing on February 7, 2019 which will mark an important step before the setting up of the exhibition modules in the area. More information to be found in the press kit.